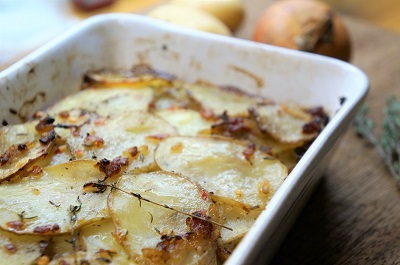 My layered potato bake recipe is elevated with a few humble ingredients such as pancetta, thyme, garlic and lemon. Slowly cooked; the potatoes melt together, enveloping the other flavours for a deliciously more-ish concoction. I use regular white potatoes which I prefer to waxier varieties for this dish such as Desiree, Charlotte or Estimacame potatoes. The floury potatoes tend to fuse together a bit more once cooked. But. Use what you’ve got and it’ll be alright. For a quicker potato bake recipe, I love rosemary roasted new potatoes. There aren’t that many ingredients in this recipe and I think that is part of it’s success. You get to taste every component. Obviously I’m never one to say a recipe should only be cooked in one particular way (I’ll leave that to the French 🙂 ). If you haven’t got pancetta then smoked streaky bacon works great. Use whatever potatoes you have at hand and you know what? It’ll taste bloody marvellous. The wine in this recipe gives a really nice yet subtle flavour and helps steam the potatoes to cook them fully. I should also mention that even though I have given times, test if your potato bake is done the old school method and insert a knife. If it glides through you’re done. If not, cook a little longer. I’ve written this recipe to serve 10 people, if you cut the recipe down and use a smaller baking dish you can reduce cooking time (see recipe below). Fry pancetta or bacon in a little olive oil until really crispy (not burnt, just very crispy) and remove (leave a couple of tablespoons of oil in the pan – remove the rest). Fry the sliced onions in the leftover oil on a medium heat until golden. Throw in the butter and garlic, stir and then turn off the heat off before adding the pancetta or bacon back into the pan with the onions and reserve. Thinly slice all the potatoes (skin on) with a mandolin or a sharp knife (you want them about 2-3mm thick, if you can. But don’t panic over a few thicker ones) and tip into the pan with the rest of the cooked ingredients and stir to coat. Tip: you may need to separate the sliced spuds by hand and possibly combine the potatoes and onions in batches if your saucepan isn’t big enough. Add the Thyme leaves, chilli flakes, squeeze of lemon and season generously. Once fully coated, pour the lot into a baking dish (again, you may need to separate them a bit by hand to get an even level), pour the wine down the side of the potatoes, cover with foil and bake in the oven at 180cFAN for 1 hour-90mins -check they are done by inserting a knife. It’s ready when there is almost no resistance. Once the potatoes are cooked, turn up the heat to 200c, remove the foil, drizzle a little more olive oil over the top, small squeeze of lemon, season again (even throw a few sprigs of thyme on as well) and pop back in the oven for 15 minutes or until they start to crisp and turn golden. Rest for 15 minutes before serving (the potatoes that is, you can do whatever you want). I find it best to cut the potato bake into squares with a knife and then serve individual portions. Karidopita – Greek Walnut Cake – the best walnut cake recipe ever..!